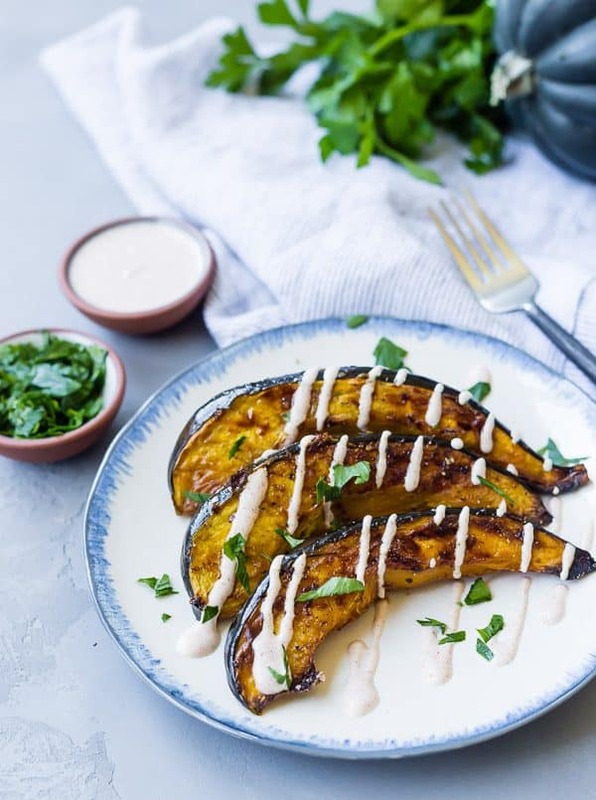 This roasted acorn squash is served with a spiced yogurt sauce that you’re going to find absolutely irresistible! 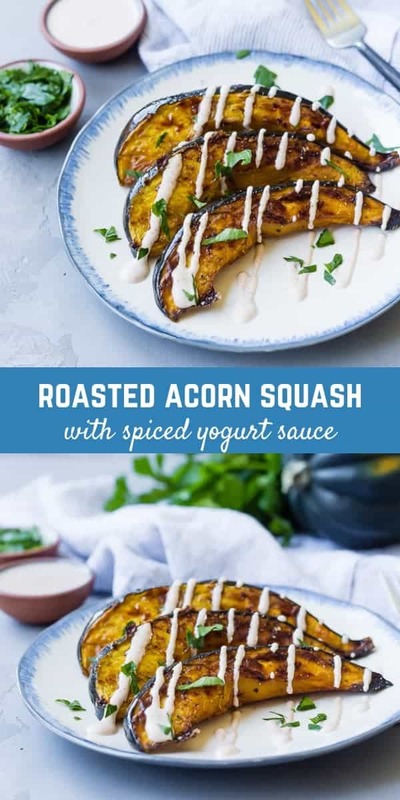 It’s a great way to switch up things from plain ol’ acorn squash! I think we can all agree that it’s officially and completely squash season. We have been eating a lot of squash and I am not yet sick of it! I don’t see that happening anytime soon, to be honest. I actually just developed another new squash recipe for you guys – I’ll be sharing that one soon! It’s a stuffed acorn squash and I may or may not make it once a week because it’s just that good. I love the filling of the stuffed squash so much that I had the extra for breakfast today. This is a fairly straight-forward roasted acorn squash recipe, but with a little twist with the sauce. It’s an easy sauce to make using yogurt, buttermilk, and spices. 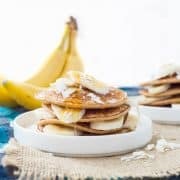 It’s unique and uses a super flavorful blend of spices that will leave you wanting to lick the plate clean. 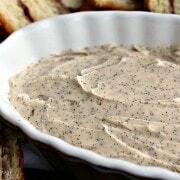 In this yogurt sauce, I used cinnamon, paprika, cayenne, allspice and garlic powder. It’s a flavor explosion and you guys are going to love it. If you’re not planning to eat this all at once, leave the sauce separate from the squash so you can give it a stir and drizzle it on right before you eat the squash. PS: If you want to cook acorn squash in a more traditional way, check out my guide on how to cook acorn squash. 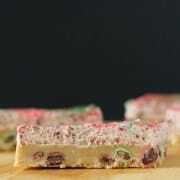 I cover two ways (sweet and savory) and they’re both irresistible. 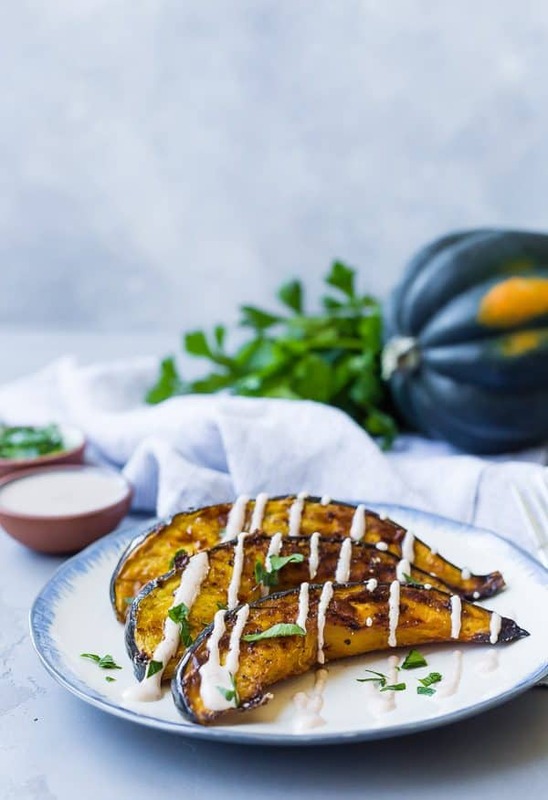 This roasted acorn squash is served with a spiced yogurt sauce that you're going to find absolutely irresistible! It's a great way to switch up things from plain ol' acorn squash! Preheat oven to 425°F. Line a baking sheet with parchment if desired for easy clean up. 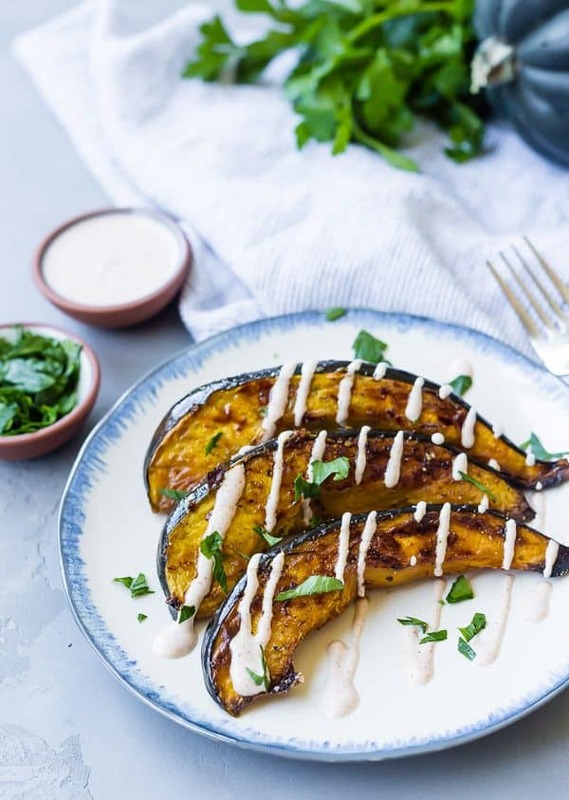 Place cut squash on baking sheet and drizzle with olive oil and sprinkle with 1/2 teaspoon of the salt and pepper. Use your hands to coat the squash evenly with oil. Roast at 425°F for 30 minutes, flip each slice and continue to roast for 20-30 minutes or until golden brown and fork-tender. 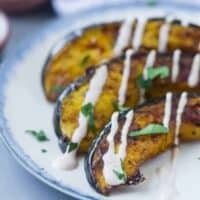 While the squash roasts, prepare yogurt sauce by whisking together yogurt, buttermilk, cinnamon, paprika, remaining 1/2 teaspoon salt, garlic powder, cayenne, allspice. 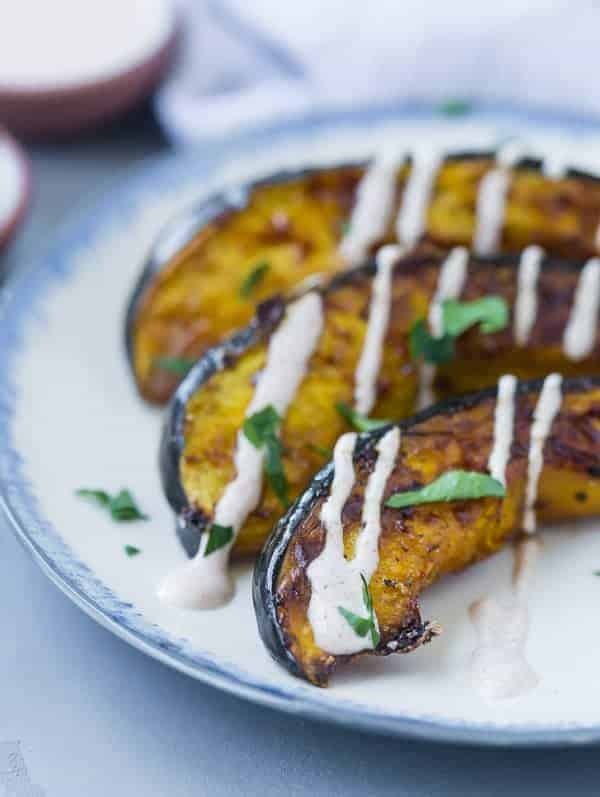 Serve squash with a drizzle or a spoonful of yogurt sauce. Garnish with fresh parsley if desired. You may not need all the yogurt sauce, depending on how much you use. If you're not planning to eat this all at once, leave the sauce separate from the squash so you can give it a stir and drizzle it on right before you eat the squash. Verdict: I loved this twist on acorn squash. It was a fun new way to enjoy it. Husband’s take: I don’t think he’s tried this (he was home one night for dinner this week and that’s not unusual!). But also I can pretty much guarantee he wouldn’t like it. Squash isn’t really his thing typically. this looks really good. my husband refuses to eat squash, so I am loath to make it because it’s a lot for one person to eat. Oh yeah I totally get that! It reheats well, though!